Open water views from this beautiful 1 bedroom, 1 bath Efficiency Apartment located on Salt Lake! The Salt Lake Lodge Downstairs is a cute efficiency apartment with a full kitchen and bathroom on Salt Lake that sleeps up to 2 people. There is a shared fishing/boat dock, 2 underwater green lights and fish cleaning stand for the guests at Salt Lake Lodge Downstairs. This is the perfect home for your fishing vacation! Bring your boat or just fish from the dock! You can also relax outside on the balcony overlooking the huge yard and enjoy cooling breezes. There is also a shared outside laundry room for all guests. There is a grill and picnic table out back so you can cook up some yummy fish after a successful day of fishing. Inside the efficiency, you will find a nicely decorated fully equipped kitchen with a microwave, toaster, coffeemaker, and blender. There is a bar top table that seats two that can also be used as extra counter space. The kitchen and living area opens to the Queen sized bed that is next to large windows with breathtaking views of Salt Lake. The bathroom has cute décor and a tub/shower combination. 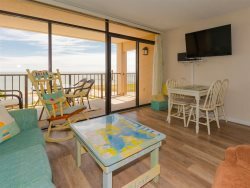 This efficiency apartment is perfect for a romantic getaway or even for a couple of serious fishermen. You can rent the downstairs out on its own or rent both the upstairs and downstairs for larger groups. All towels and linens will also be provided for your convenience. Salt Lake Lodge Downstairs is just minutes away from the Rockport beach and downtown Rockport. You will never run out of things to do near this vacation spot. Check out some of the public fishing sights nearby and spend the day in the sun. Rockport Beach also allows fishing and is only five dollars for a day pass or 20 dollars for a year pass. We have a list of fishing tips on our site as well! Downtown Rockport is filled with shops and restaurants if you feel like a night out and some fresh seafood on the water. This is also a prime location for birding! Little Bay has many protected areas for birds that you can enjoy while walking along the water. Rockport is home to many historical sights and parks as well, including the Fulton Mansion, Goose Island State Park, and The Texas Maritime Museum. Never run out of things to do and places to see, plan your Rockport vacation today! Book now for a vacation you won’t forget!